The on-site food pantry, located in the St. Francis Xavier Center, assists low income families in need and provides thousands of to-go boxes of food each year. In addition, pet food is available for their pets. 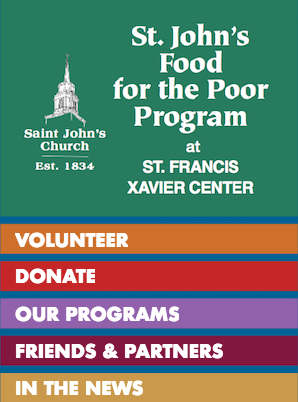 All 20 of St. John’s Food for the Poor Programs are made available to our guests. In addition to several supermarkets and specialty food stores, colleges and churches provide the bulk of the food for the food pantry. Every day, after their hot meal, a free Take-Home Food Table is available to guests for extra take- home bags of food. Food selection changes daily. Options are canned foods, breakfast cereals, fruits and vegetables, and fresh milk. Food assistance is provided to homeless individuals and families in need of help. Special take-out foods are given to the homeless people living under bridges, in cars or vans, in makeshift houses, in parking lots or in area woods. The center also provides social service referrals. Working Poor Free "Box Lunches"
Many guests at our soup kitchen are the working poor. Many of these men and women are in low wage jobs or part-time employment and the individuals cannot afford to buy their own lunch. To help solve this problem the soup kitchen provides the working poor a free “Box Lunch” take out service for those who cannot afford to buy lunch. The St. John’s Food for the Poor Program, in cooperation with one of its leading partners, Stop & Shop, developed a new program to promote good nutrition. The program is made available to low income families and provides them with free take-home fruits and vegetables each Saturday morning from 8:00 to 10:00 AM. The education program is designed to prevent obesity. The goal is to reduce long-term chronic disease risk by promoting increased fruit and vegetables consumption.